Mazda's seemingly harmless partnership with Universal's 'The Lorax' has resulted in an online petition calling on the automaker to remove all ads from TV, print, radio and online. Rethinking the Automobile has called upon Mazda to remove their new ad campaign, which features the new movie Dr. Seuss’ The Lorax. The group claims that the new ads for the Mazda CX-5 SUV are “offensive” and run counterintuitive to the true message of Dr. Seuss' original book. Rethinking the Automobile, which is a project of OpenPlans, argues that the marketing campaign is a “crass commercialization” of The Lorax and is misleading to children. The group was so offended by Mazda’s alleged exploitation of the book that it began circulating an online petition on Tuesday. The petition is presented as being written by the Zozo, a creature that believes in "smart transportation solutions including walking, biking, and transit so that kids can grow up in a world with safe, healthy, livable, walkable communities.” Created by the Jim Henson Company, the Zozo was designed to educate children on the dangers facing the environment. It seems that many YouTube viewers agree with Rethinking Auto in the anti-Mazda sentiment. 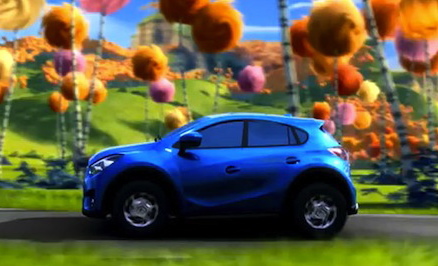 Mazda’s commercial called “Truffula Tree Certified - Mazda CX-5 and Dr. Seuss' The Lorax,” has been viewed over 72,000 times on YouTube and has earned just 97 likes versus 831 dislikes. Despite the backlash against Mazda, the automaker has created one of the most fuel-efficient SUVs on the market with the 2013 CX-5. The all-new SUV gets an estimated 33-mpg highway and 26-mpg city with the manual transmission and 32-mpg highway/25-mpg city with the automatic transmission. Fuel economy slips just slightly with the all-wheel drive version to 25/30 mpg. Rethinking the Automobile was created by Mark Groton, with the intention of raising awareness of the damaging impact that automobiles have on the earth. The group utilizes public events and media campaigns (such as this petition) to demonstrate how prioritizing the automobile is hazardous to an unsustainable world. Click HERE to see Rethinking Auto’s online petition or get involved in the Twitter discussion via the #savelorax hashtag. Someone tells these idiots that the CX-5 gets a class-leading 40mpg US in Europe and gets an EPA rating of 35mpg highway in its gasoline iteration and even higher numbers in the diesel option. Only hybrids are showing those kinds of numbers in the SUV market. These idiots are only complaining because it's an SUV. They obviously don't know how to use Google to look up anything remotely factual. I'd be willing to bet that 90% of those signing this dumb petition drive cars that get worse mileage than the CX-5. Aaron you are mistaken. It is not about the milage, it is about how a story has been co-opted by corporations to sell things that are antithetical to the meaning of the story itself. If your argument is that getting better gas mileage means slowing global warming, I can understand your indignation. But you miss the point that dying slower is still dying. By example, an argument about whether to drive a Ford or Chevy truck is disingenuous because the real discussion is, 'How do we safely, effectively and enjoyably move things from A to B.' A discussion about a less, but still polluting vehicle in this context is a lesser of two evils argument. If your intention is to vent your frustrations with name calling, so be it. But if your intention is to have a conversation that leads to a solution, you might rethink your style. Then why isn't the petition targeting the movie studio that made the film and licensed the rights to Mazda and to the executors of Seuss' estate that licensed those rights to the film's producers? Why go after Mazda, which is only using the tie-in to advertise in the same way Burger King, McDonald's, Ford, the Humane Society, and others all use them to promote their products or messages? Seems to me like the group, this dot org that hopes we'll all stop driving our cars, is using this petition as a lame way to promote themselves. All of this assumes you believe in the anthropogenic global warming storyline to begin with. A premise which is on awful shaky ground, "consensus" of UN "scientists" or not. I'm all for better efficiency, less use of petroleum, and smarter energy solutions. I think we need to do it for the right reasons, however, and in a way that is realistic, not by acting like religious zealots over non-issues like this. Excellent, I agree with much of what you said. Thank you for restating. ,,,because the real discussion is, 'How do we safely, effectively and enjoyably move things from A to B.' OK. Bicycles, push carts? I can't think of anyway to move things from A to B that doesn't involve energy. In addition, I can't think of any way to generate energy that doesn't have some downsides - oil, coal, wood, NG, nuclear, wind, geothermal? While I like living in an environment with less pollution, I also like the conveniences of a modern economy and the advantages of a modern society. The fact that the Mazda CX-5 uses less energy and generates less pollution than any other vehicle in its class - including hybrids, seems like a good thing to me. It, in fact, moves things safely, effectively and enjoyably from A to B. Perhaps, it would be good for you to share your transportation vision. However, I'd caution against the perfect being the enemy of the good. Great response rokidtoo, I am a slow typist and this is a very large discussion so I will do my best, and apologize in advance. I am in complete agreement about not moving forward just because something is less then perfect. I do not believe in perfection, everything is change. I suggest you become familiar with William McDonough's work, and the Cradle to Cradle concept, or waste = food. There is a 20 minute video where he packs what usually takes him much longer into this shorter talk, if you can keep up with him. youtube.com/watch?v=WEyYFYDBhW0 Although this may not seem at first to answer the transportation question, it is actually the context in which a solution will come. I do not think a one size fits all answer to the transportation challenges will work. I would love to see algae grown in the desert using atmospheric carbon to produce diesel as a major source. I have an old Mercedes Diesel that takes a wide range of fuels and gets 30 mpg. There is also the possibility of tapping methane from household waste (including humanure) to run a recarborated vehicle. This has been done. Gasoline is cheap amazing powerful energy. But it will become more expensive. It is wiser to use it while the extraction process is still relatively inexpensive to create the platform for our next energy base. Thanks for your comments.